Note: This is a volunteer-based, non-paid position. Able to fairly and maturely assess video game content with eloquence and poise. Able to research (investigate and fact-check content) before making posts and respectfully link to and cite sources. 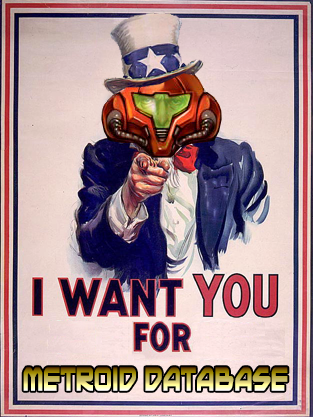 Have plenty of spare time and willing to be dedicated to make major contributions to the Metroid community. Conduct yourself in a way that is befitting of our site. Have access to your own computer, smartphone, and internet (If you don’t have all of these, this is a deal breaker). Have accounts and familiarity with social media apps like Facebook, Twitter, Instagram, YouTube, Discord, and Twitch. Know basics of HTML and CSS. Good writing skills (grammar, spelling, and prose) are highly preferable. Familiarity with CMS (WordPress) for adding new content to the site. Interested parties should submit a 200-500 word statement as to why you’re a good fit for the position. Email contact@metroiddatabase.com with the subject line “MDb Site Editor.” Note: Photos/proof of your Metroid fandom will only help to pad your application. Thanks to any applicants! If you seem like a good match, we will be in touch.